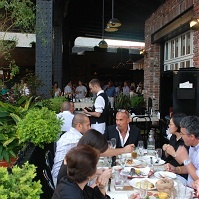 It has been about a year since I stepped foot in the Meatpacking District. I know it’s a long time, but there were circumstances. I moved to Brooklyn, was planning my wedding, then got pregnant, and somehow waddling around the cobblestone streets, trying to keep my balance while the beautiful people strutted past in their Loubutains was not really high on my agenda. I think the last time I was there was for a Diane Von Furstenberg sample sale and at the time, the High Line and Andre Balazs' Standard Hotel were works in progress, very far from completion. So the other night, when Susie, Jamie and I met for dinner at The Standard Grill, my breath left my body when I took in the scene unfolding before me. As I walked down 14th Street, passing shiny new shops where just a few years ago they were hauling bloody carcasses across the cement, I spied treetops peaking out above the formerly abandoned 80-year-old rails in the sky. And as I turned down Washington Street, right there across the street from Hector’s Café loomed The Standard Hotel, an oasis of design against the night sky. Wow. Make no mistake. Even to someone who has been to the Meatpacking a bit more frequently than I (that would be pretty much anyone not living under a rock), The Standard Hotel is a spectacular sight. It hovers over the High Line like a spaceship—albeit one built by Polshek Partnership’s Todd Schliemann in Le Corbusier style, tall stretches of cool glass and strong layers of graying mortar, propped up on two hulking pillars confidently straddling the High Line and the citizens of the Meatpacking: slick-haired men with chest hair boldly exposed, hipsters in those de rigueur straw top hats, and your usual flank of long legged lovelies in stilettos sticking into cobblestone streets. 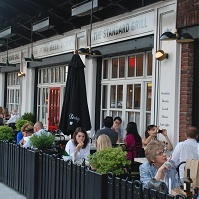 Like most restaurants Balazs opens, The Standard Grill is a powerful magnet for A-List crowds and, well, crowds in general. It’s located in a space under the hotel’s belly, and like the hotel, it is a design masterpiece. This should come as no surprise. Balazs, like Keith McNally, is not one for just serving food. He serves an experience, detailed down to the doorknobs, that speaks to a theme or a feeling. Whether it’s St. Tropez at Sunset Beach in Shelter Island, or a New York grill circa 1940 as in The Standard, you are transported. Prepare to be moved. While there’s a bit of an attitude at the front desk (the hostesses could not have been chillier), the iciness does not seem to have deterred anyone from coming ‘round. We found the front bar, washed in white with café tables and black and white tiled floors, packed. It was your typical MePa style zoo. Shoulder-to-shoulder crowds vied for seats at the long bar where charcuterie, chilly oysters and freshly mixed cocktails were being served in astounding quantity. It’s a bit of a wild party in there, and if that’s what you’re looking for, you will enjoy. Ditto the outdoor lounge and the al fresco Standard “beer garden,” which will begin serving a menu of sausages and the like come September 8th. But the dining room takes on a more serene air than the frantic bar and café. It feels like it’s part Grand Central Oyster Bar, part old New York steakhouse with its barreled ceilings twinkling with white tiles, half-moon burgundy button-tufted banquettes, burnished wood-slotted booths, and polished tables. Its precise old New York décor was created by Hollywood set designer Shawn Hausman and the NY design firm of Roman and Williams, and it feels like you might find a cigarette girl strutting around the room selling Lucky Strikes, or the crew from Sterling Cooper tucked in for a three-martini lunch. Hey, if Draper and friends had any of the food we did, they’d enjoy themselves. They’d actually eat as much as they drink for a change. 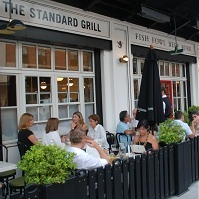 I’m certain The Standard Grill would become their regular haunt. Dan Silverman, of Union Square Café and Lever House fame, is installed in the kitchen and he’s assembled a cracker jack team of cooks who are doing a seriously impressive job with a menu of reasonably priced seasonal American fare that matches those tufted banquettes in tone and style. The common theme throughout Dan’s menu is an interplay of flavors that keeps the mouth excited and interested. There’s nothing flat or dull about his food. And yet it’s still simple, not overly fussy or complicated. I loved it. Lobster Louis—a chilled lobster salad—is given new life with the addition of a hearty dose of cayenne pepper. That heat plays perfectly off the sweet lumps of lobster tossed in a colorful mound with red peppers, scallions, and green olives ($23). Spoon this salad on a soft brioche roll and you’d reinvent the Maine classic like never before. Dan's also doing great things with halibut—grilling a hefty steak so it’s moist and succulent and adding a zippy paprika-tinged hollandaise. It’s all set up over rows of beautifully blanched asparagus. It’s an easy crowd pleaser. So, apparently, is the Million Dollar chicken, which we did not order, but wished we had. First of all, it’s only thirty-two dollars, not a million (and it serves two). Secondly, it’s served in a cast iron pan with thick cut slices of country bread and when it arrived at the table next to us, I almost reached over and yanked off a drumstick. Would they have really missed it? Maybe a wing? In any case, next time, for sure. I should also mention that even before the real food arrives the kitchen sets every table up with a basket of warm bread, a bowl of breakfast radishes, and three little bowls each filled with butter, sea salt, and hunks of salty aged pecorino. It’s like a little picnic before dinner. Just add rosé. And while you’re at it, add the chicken liver mousse. I have a daughter now, and that should be reason enough not to clog my arteries with the likes of chicken liver, but it was impossible to stop spooning Silverman’s Chicken Liver “Royale” ($10) onto the golden toast points on my plate. It’s the equivalent of a bag of potato chips. You can’t stop at one. Ditto the Foie Gras Torchon ($16), which I used to smother a brioche crostini over and over again. Eating these foods with abandon cannot become a habit without imminent hospitalization, but once in a while they sure are wonderful. Unfortunately, the steak tartare “a Go-Go” ($14) was not as good as the patés. While it was a nice portion of diced ruby red beef, it was as though the seasoning was left behind in the kitchen. It needed more mustard and Worcestershire. It didn’t impress. But all other dishes did. A delicious expression of the season came in the form of a gorgeous salad of julienned snow peas tossed with radishes in a cider vinaigrette ($9) given a little bite with a spot of mustard. It’s light and refreshing, but its got punch, too. Nice. Other appetizers are more substantial than the snow pea salad, like a charred Spanish octopus—tender and meaty—over diced sweet potatoes warmed with chiles ($13). There’s also a great squid dish stuffed with Merguez and plated with grapefruit and fennel ($11). While the restaurant doesn’t do many pastas, there’s one on the menu and it’s lovely for summer: plump little hand-made sweet pea ravioli are tossed with mint and pistachios ($15). While I’d have liked a little more acidity in the sauce (just a bit of lemon), it’s a dish that would make for a nice light dinner, or you might order it as a starter or side dish for the table to share. One of our favorite dishes of the evening was from the “Grill” section: a simple Rainbow Trout from Sunburst Farms ($16) served butterflied with a little currant and pine nut relish. The relish was completely unnecessary and in fact was almost a distraction from the main event. Really, all that was needed was that glorious fish and the wedge of lemon it was spritzed with. We all marveled at how a simple Rainbow trout could be so tasty, but it was: moist, flavorful, and lovely. The fish is not served with any accompaniments (other than the relish), but every night the kitchen sends out a side dish on the house. While this is unusual—I’ve never before seen a section of a menu called “ON THE HOUSE”— it’s a generous and remarkable touch, especially in these tough economic times. The night we were in the “ON THE HOUSE” selection was a bowl of crispy fried potatoes drizzled with smoked paprika aioli (think patatas bravas) and they worked well as the trout’s complement. But so would the Greenmarket sugar snap peas with brown butter and sage ($8), the roasted Satur Farms gold and candy striped beets ($7), the potato and corn pancakes with Béarnaise, or the French fries ($6). Indeed, Dan’s sides are all so good and so different that you might just stop by one day and make a meal of all of them (there are nine to choose from). Dan shares his kitchen with pastry chef Frederick Aquino, formerly of Spice Market, who’s having a lot of fun. In particular, he serves a light and fluffy sour cream cheese cake topped with blueberries and anchored by a graham cracker crust, and something called “The Deal Closer”—a massive glass bowl of chocolate mousse layered with moist slices of chocolate cake, topped off with a monster sized cloud of freshly whipped cream and a shower of dark chocolate shavings. To consume your chocolate heaven you are presented not with forks, not with spoons, but with, well, spatulas. Get ready to shovel. Jamie, Susie and I were stuffed, but we could not resist a plunge into the mousse, and so spatulas poised, we went in. Soon we could not stop. We were in a chocolate-induced feeding frenzy. Our inner six year olds had escaped, were now running wild. How fun. As I left the restaurant, almost unable to navigate the crowds that had formed in the bar, I knew it would not be another year before I returned to the Meatpacking. The Standard Grill is too good to stay away from for that long. So I’m already planning my return, with Craig, Emily, her stroller and all. Dinner starts at 5pm. See you then!